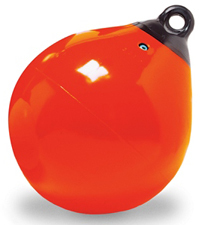 Surplus Unlimited: Tuff End Red Buoy 21"
Tuff End Red Buoy 21"
Line hole diameter 1-1/2". Buoyancy 180 lbs. of the commercial marine industry. Made from injection molded vinyl tested to 2000 psi tensile strength. Large line holes that will accept standard shackles. Curved design hole prevents chafing.